Succeed In Cambridge English. Proficiency. 8 Practice Tests. Student's Book. Self-Study Guide. Full-colour Speaking section for Paper 3-Speaking Self-study Edition; a comprehensive guide including: a Writing Supplement with model Compositions marked according to Cambridge ESOL guidelines detailed JUSTIFICATION of the Answers for all key parts of each practice test Audioscripts & Key GLOSSARY with English definitions available. Cambridge English: Proficiency is a high-level qualification, at Level C2, the highest level of the CEFR scale, that is globally recognised by companies, universities and governments. It is intended for people who want to achieve exceptional ability with English in order to study at university or seek jobs at senior management level in international business settings. The Cambridge English: Proficiency certificate is a proof of your ability to use English at the highest levels of academic and professional life approaching that of a native speaker. 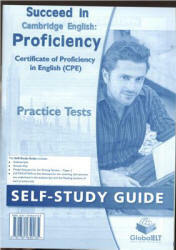 The test consists of four papers, Reading, Writing, Listening and Speaking, and it tests all areas of language ability. The new 201 3 format of the exam is shorter than the previous examination by approximately 2 hours. Each of the four papers carries 25% of the total marks. Tests for the new 2013 exam format which aim to help students acquire all the necessary skills needed to pass the Cambridge English: Proficiency exam.